Toss the shallots with 2 tablespoons olive oil, season lightly with salt and pepper. Put shallots in a glass roasting dish and cook for 10 minutes. 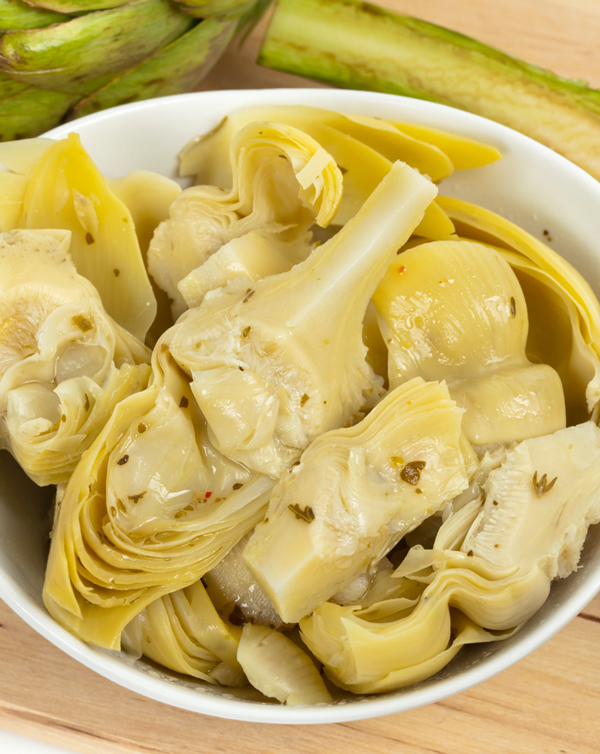 In the meantime, toss the artichoke hearts with 2 tablespoons of olive oil. Add the artichokes to the shallots and continue to roast for 15 - 20 more minutes. Remove artichokes and shallots from the oven and allow to cool. Whisk together remaining 2 tablespoons of olive oil, lemon juice, vinegar and Dijon mustard. Roughly chop the olives. Toss the artichokes, shallots, green olives and whisked dressing and mix well. Refrigerate until ready to serve. Flavors are best enjoyed at room temperature. Can be served cold as well.